Type: EQUIPMENT. Detail: COMPUTER. Product Code: M812. A top level, luxury computer that will probably beat you but it is possible to change the levels of play to have a chance of victory. 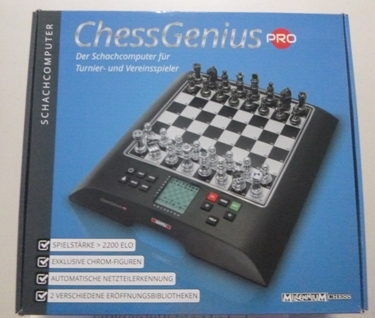 The MILLENNIUM ChessGenius Pro allows you to make moves on a chessboard and the computer plays to a top level of 2200 elo. It runs on batteries or can be powered by a charger which is recommended, see product code M811. On the chessboard (20cm by 20cm) there are elegant chess pieces in white chrome (white pieces) and black chrome (black pieces), which have felt on the bottom of the pieces. Playing levels and playing difficulty: Average time per move can be changed if so desired. Max overall duration of game configurable. Includes demanding tournament levels suitable for skilled players. Special Matt in X stage for problem solving which is basically if you see a checkmate in three diagram in the newspaper, the computer can reveal the answer. Countless levels especially for beginners. Shows suggested moves (best, second best, third best etc. moves from the respective position)Especially for improving players: Chess trainer: Warns about bad moves, offers to take them back and makes suggestions for improvement to help make better moves. Help function: Shows all permitted moves. Fully flexible opportunities to take back moves.Features and ease of use: Convenient menu system makes it easy to adjust system settings. Large backlit display: shows the entire chessboard, plus help text and menu system text. Extralarge chessboard: 20 x 20 cm playing area. Multilingual user interface. Different match modes: Player vs. computer, player vs. player etc. Improved energy saving mode with longer active times. Power port for AC adapter (power pack sold separately M811). Automatic power supply detection to switch off the powersaving mode in network operation.Technical details: Processor: ARM Cortex M4 / 120 MHzRAM: 160 KB. Chessboard: Pressure sensor board, magneticDisplay: Backlit chessboard display. Menu operation: 7 languages, textbasedLanguages: GB / DE / FR / NL / ES / IT / RU. 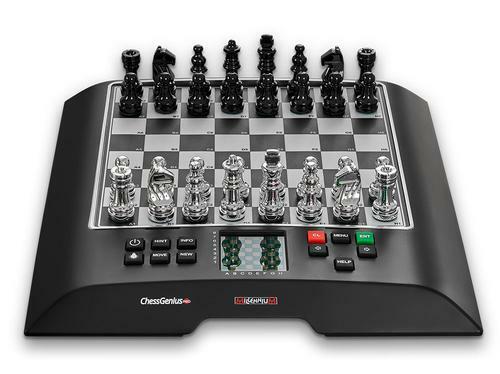 Software: Original CHESS GENIUSPower supply: 3 x AA alkaline batteries Power port available (power pack sold separately M811)Dimensions of presentation box: approx. 30 x 27.5 x 3 cm. Chessboard dimensions: 20 x 20 cm. Charger for ChessGenius. COMPUTER. $25.00.